One of our most darling crafty customers, Saffron, and her mom, Shannon, came to visit us recently. 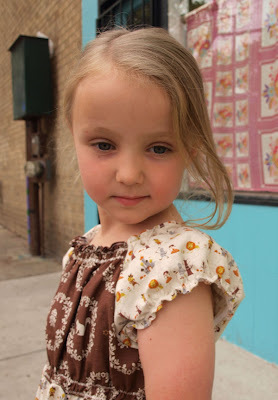 Saffron was proudly wearing her five year birthday dress, which also happens to be, she says, one of her top five dresses. She told us all about how she chooses fabrics, what her other top dresses are and honored us with singing "Somewhere Over the Rainbow" in its entirety. She is pretty amazing! 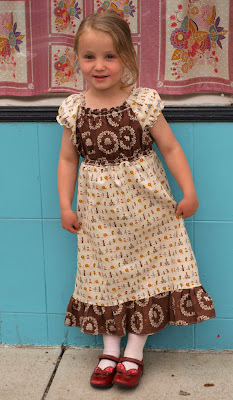 Her birthday dress is made from a Portabellopixie sewing pattern with brown Echino fabric and a cute Japanese Wizard of Oz print. How perfect paired with her little ruby slippers! 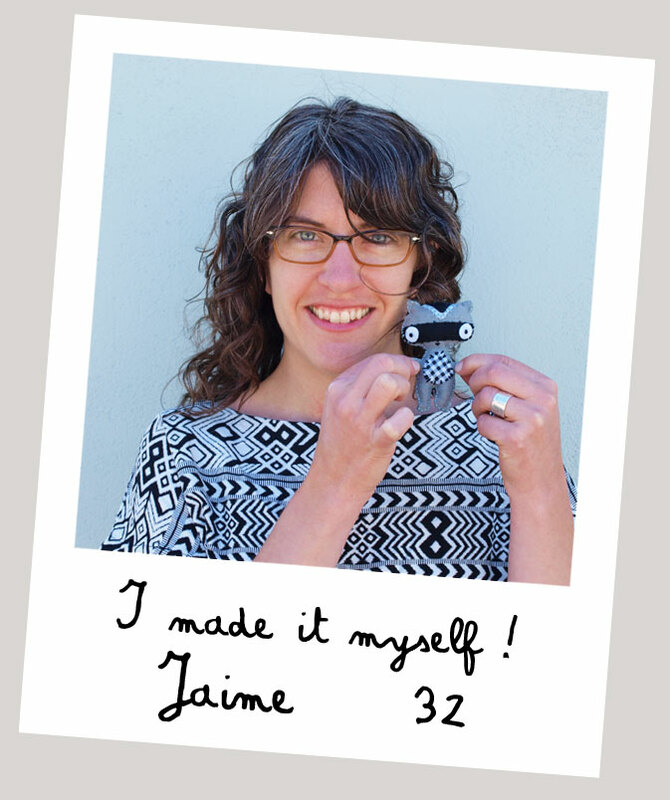 Tell us about yourself and the crafts you like to do. I like sewing and painting. Sometimes I go to the Nature and Science Museum and the Denver Botanic Gardens to draw. Tell us about the dress you are wearing. My mom sewed this for me for my 5th birthday. I picked out the patterns and fabrics. My mom got some great tips and help with sewing this at Sewing Help Night at Fancy Tiger Crafts. I just started sewing and sewed a pink bunny. I really want to learn to sew more. 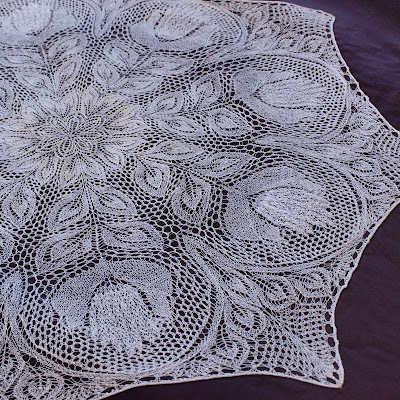 I'm going to learn more at craft camp at Fancy Tiger this summer! Thanks Saffron and Shannon! Happy sewing to both of you cuties! 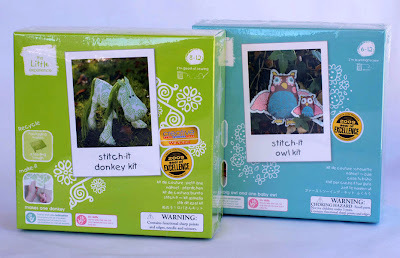 Stitchin' Challenge! Rainy Days and Little Splashes Hooded Raincoats! 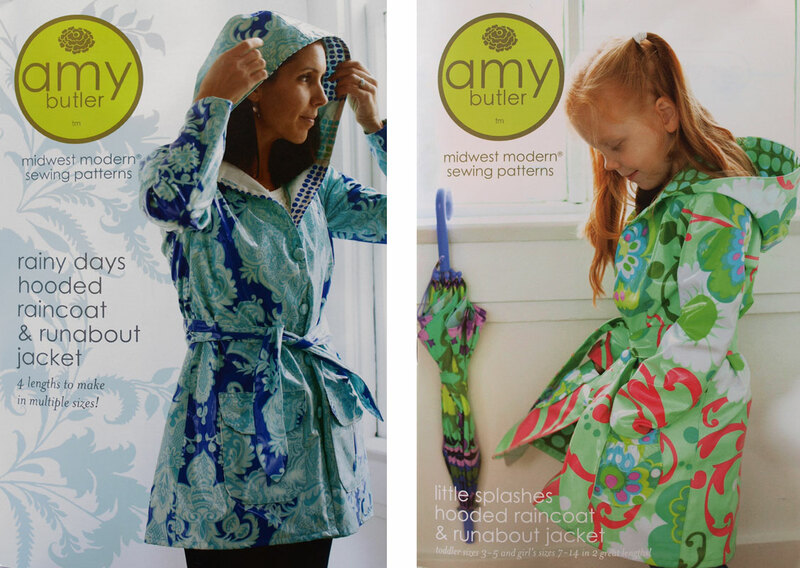 We are so excited about Amy Butler's two newest sewing patterns, the Little Splashes Raincoat for girls and the Rainy Days Raincoat for grown-ups. 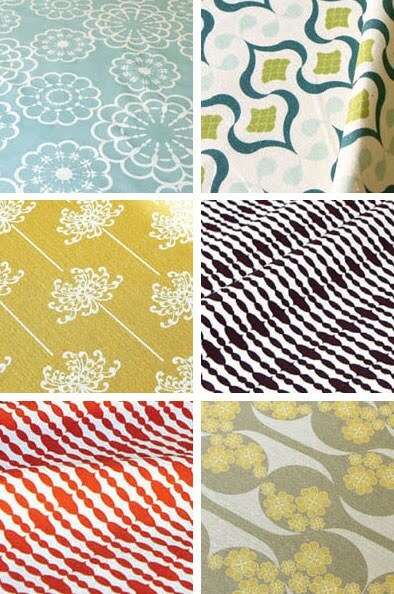 What a perfect way to use all the pretty new laminated fabrics that have been coming out lately. 1) We'll feature you on the blog! 2) You will get a $20 gift certificate for your next Fancy Tiger Crafts purchase! 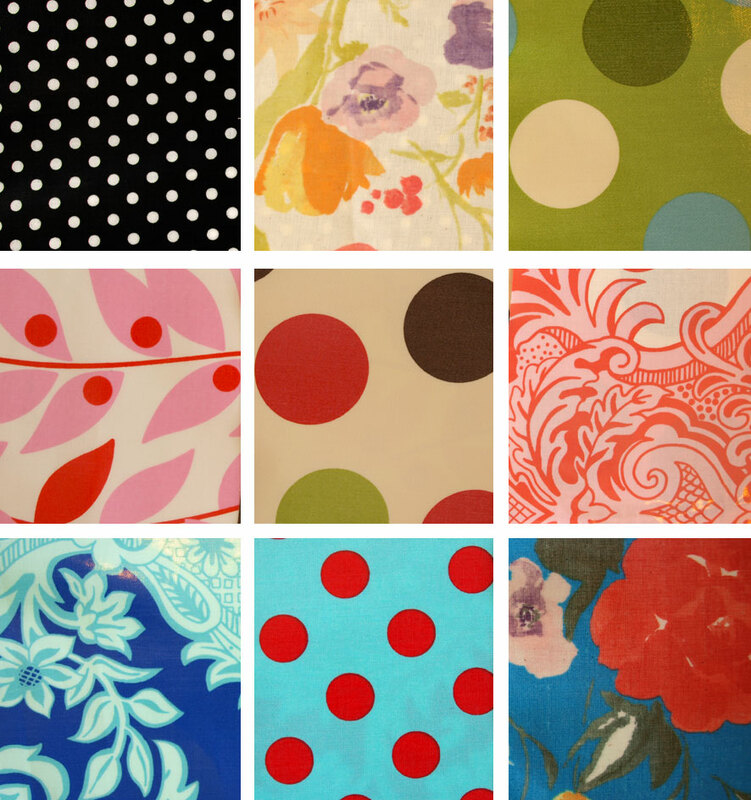 Here are some of the cute laminated fabrics that are in the shop right now just waiting to be made into a cute raincoat. Miranda recently visited us from Frisco where she works at the local yarn shop What's Needling U. She is not only a knitter--Miranda came in sporting the most adorable honeybee dress which she had just made from the Built By Wendy: Dresses book. Cuute! I knit and sew, mostly. 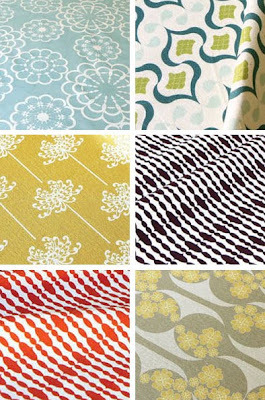 I've always loved fiber and fabric--now I get to work with it full time and help others at What's Needling U in Frisco! Tell us about your sweet dress. It's the 9-5 sheath dress pattern from Built By Wendy: Dresses. 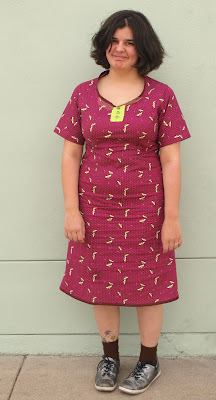 The fabric is Hive by Patti Young with magenta honeycombs and acid yellow-green bees! My mom taught me how to sew. I learned to knit from a book at a reeeeally boring job. New! Swanky Swell Screenprinted Fat Quarters! Swanky Swell fat quarters are here! 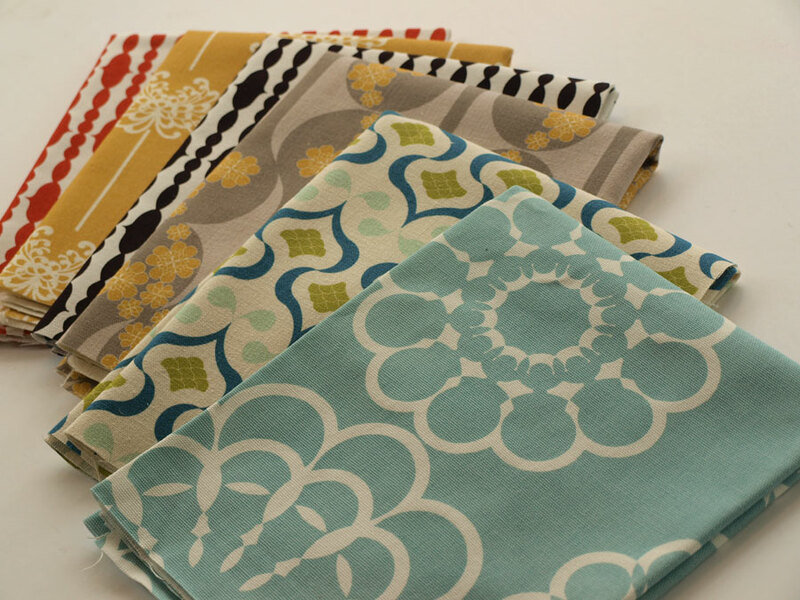 These modern prints are designed and hand screenprinted by Nina Jizhar on an organic cotton/hemp fabric. This super eco-friendly fabric is sturdy enough for bags and small upholstery projects and is oh so pretty and unique! Franki must be the most patient crafter of all time. 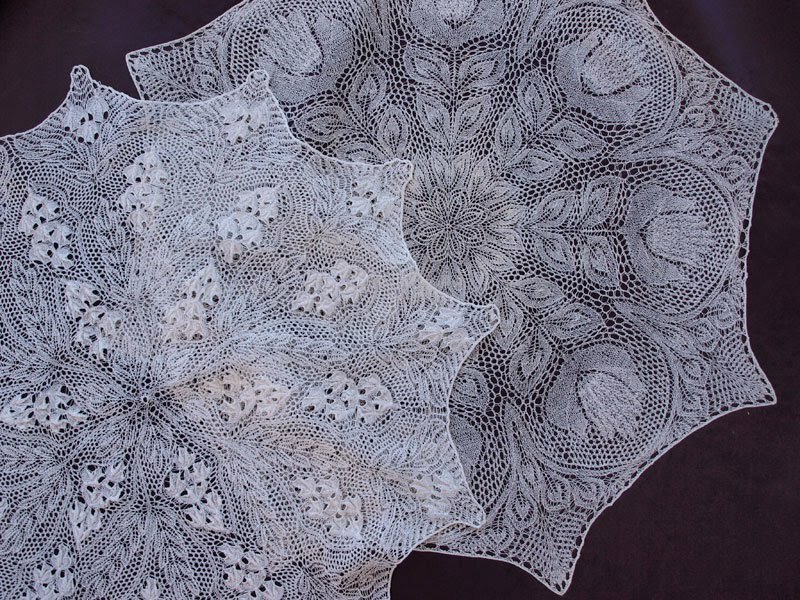 Her beautiful lace knitting projects take upwards of 150 hours each to complete. 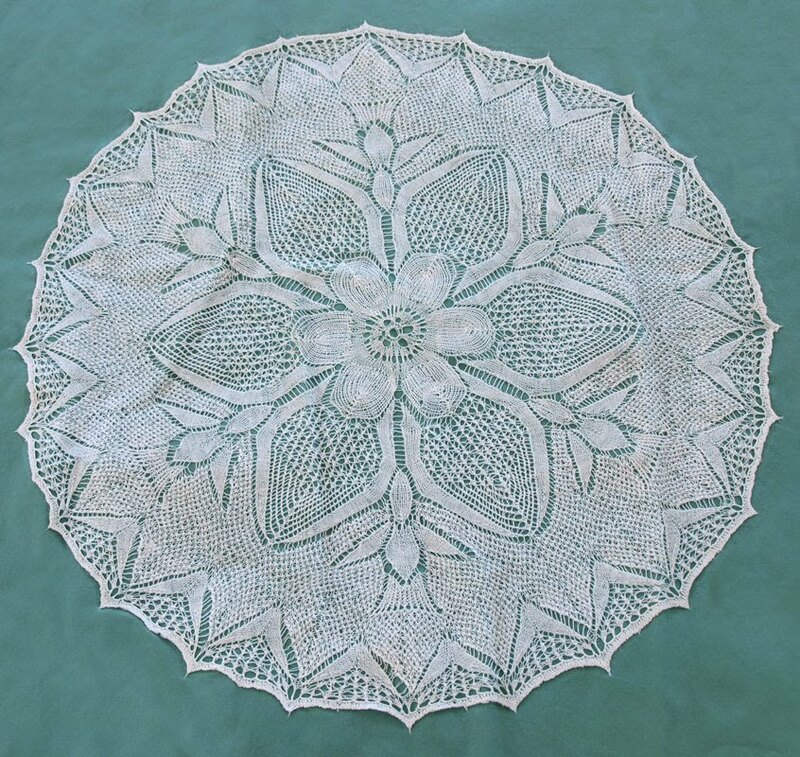 She has taken these lace knitted tablecloth patterns, originally meant to be knitted with a size 2 needle and a very skinny yarn, and made them tiny intricate masterpieces that are knitted with the thinnest of thread on needles that measure 0.75 millimeters! Tell us about yourself. What makes you want to craft? By trade I am an office goddess. The rest of the time I read, write, garden and take pictures. My people have "smart hands" that itch to do things. Tell us about your knitting project. 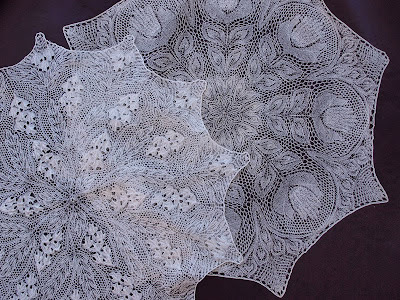 These are lace knitting--Neibling's Lyra (on purple), Goldregan (unmounted) and Kinzel's Daffodil (on blue). 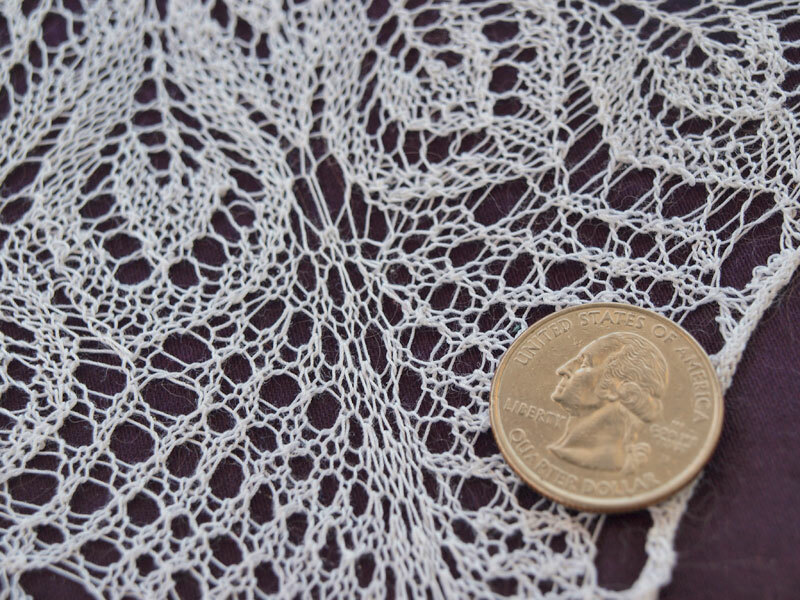 For Neibling's Lyra and Goldregan I used size 000 knitting needles and quilting thread. 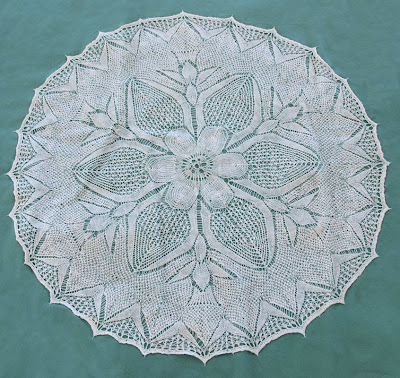 Kinzel's Daffodil uses 000000 knitting needles and 100/2 thread. How long does it take you to complete one piece? 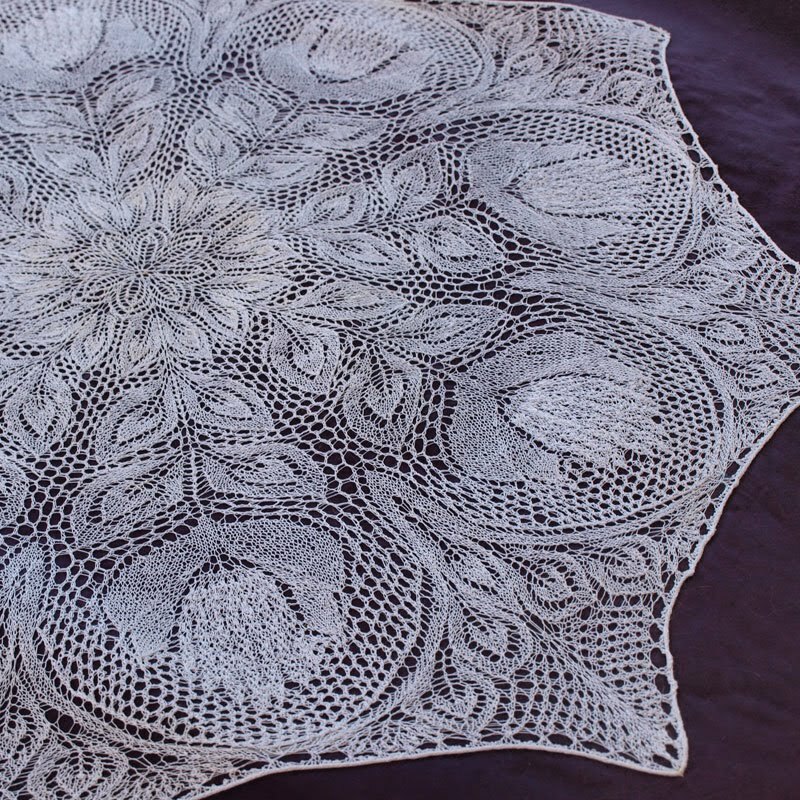 Depending on the compexity of the pattern, one to three months, knitting at least 3 hours a day. I taught myself to knit when I was 10. I learned to quilt, sew and embroider from my mom, but never really glommed on to doing those crafts. Thanks Franki! 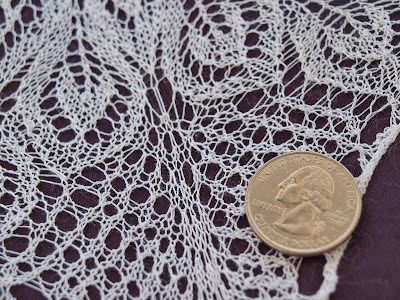 Happy lace knitting! New! 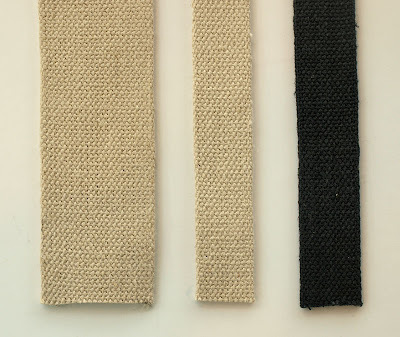 Hemp Goodness--Denim, Jersey, Webbing and More! 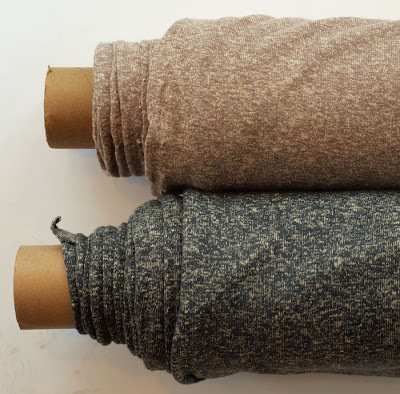 Check out the new hemp wovens: a denim and a ticking, both 55% hemp/45% organic cotton, and on the right a tweedy 55% hemp/45% recycled cotton, the bits of recycled cotton adding a touch of color and texture. 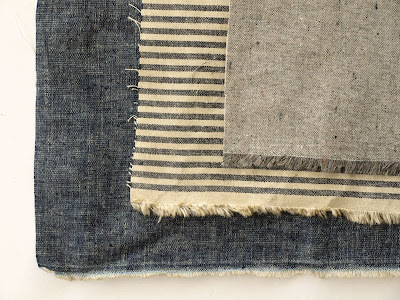 I've never seen a lovelier denim than this--oh my goodness, it's pretty. 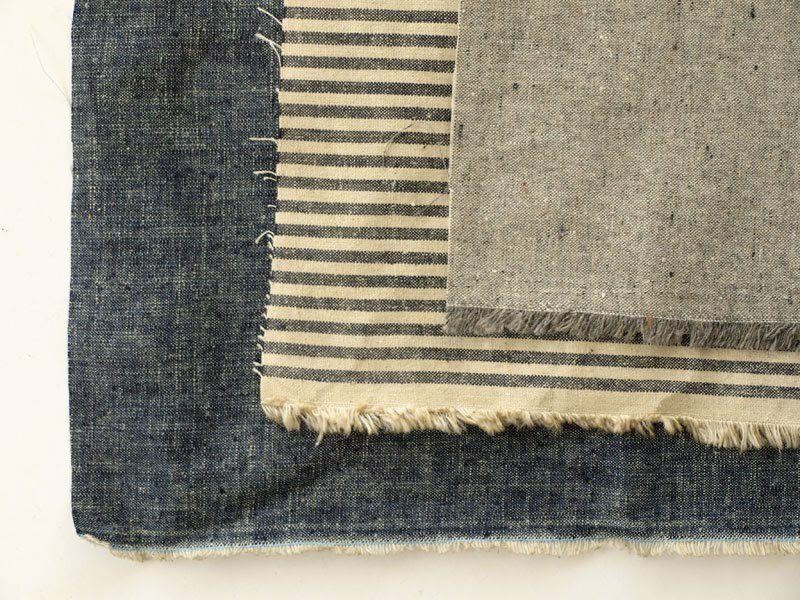 We are imagining crisp denim dresses for summer, hemp ticking sailor blouses, and tweedy summer bicycling shorts. 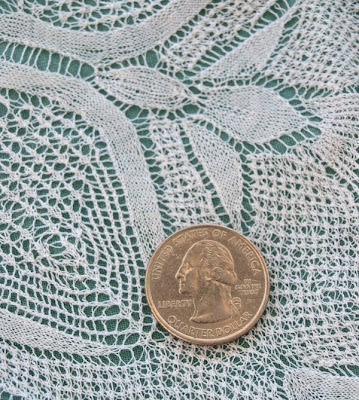 This fabric makes us swoon. Hemp is perfect for summer--it is cooler than cotton and naturally antibacterial so it will keep you cool and fresh on summer days. 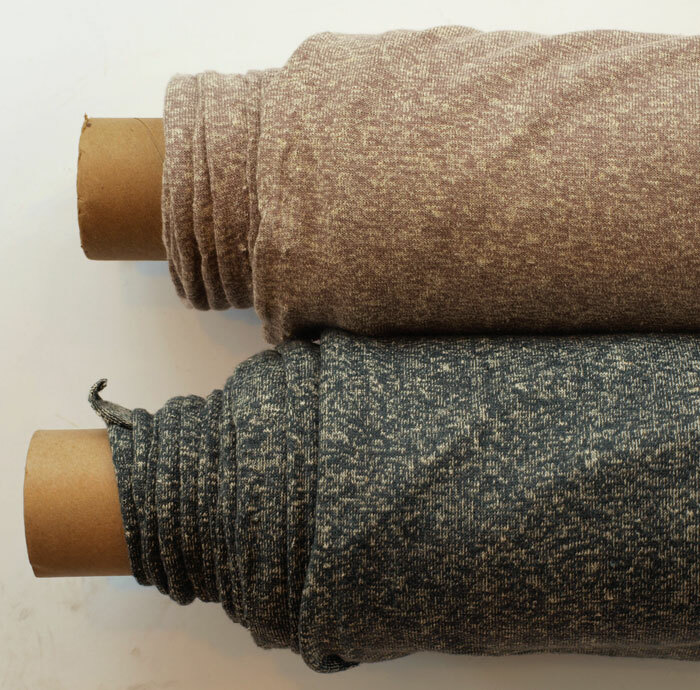 We also have a new hemp/organic cotton jersey, perfect for tees and soft baby items. 100% Hemp cotton webbing is here, too. It is super strong and works great for bag handles, belts and dog leashes. Kate is an amazing knitter. 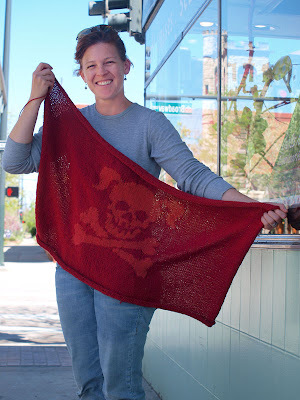 She teaches knitting classes at Common Threads in Boulder and also helps to organize a knit night in Boulder that is super fun! We love her most recent finished object--a pig-tailed, intarsia skull and crossbones baby blanket! Sweet! I am a knitter. As much as I'd like to transition to sewing, the yarn just calls too strong. I got started because of the color and haven't yet run out of inspiration. This is a baby blanket for some friends of mine who are expecting their first (a baby girl!) in July. 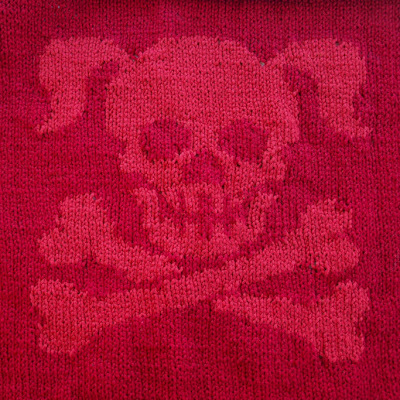 I created the pattern and am proud to tell you it's my first intarsia project. Go graph paper! A friend of mine from the East Coast sat me down and taught me about 8 years ago. She told me that the meditative aspect of the craft would be great for me and the Type A part of me would be satisfied with the final result. Gecko. They do push-ups when no one is looking. Geckos really do push-ups? My googling tells me you aren't joking! The Little Experience craft kits are here! These kits for ages 6 and up have won awards-a-plenty for teaching skills like hand-eye coordination and creativity. Plus, they are so darn cute who can resist them? 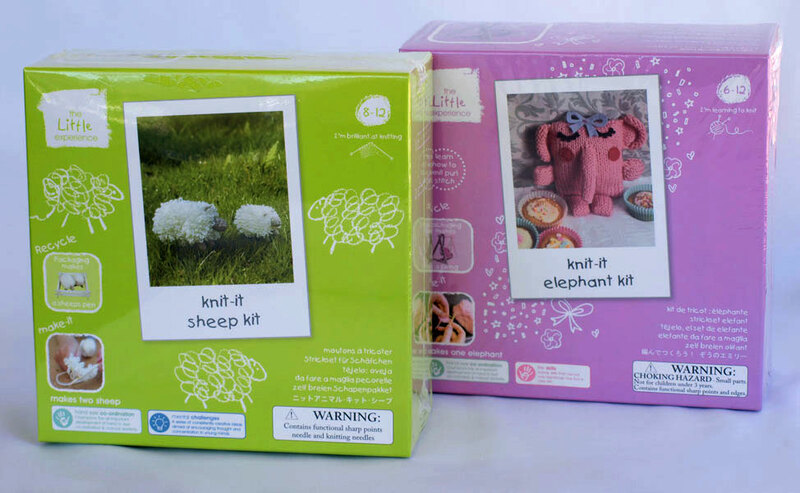 There are also bigger kits for making your own adorable toys. 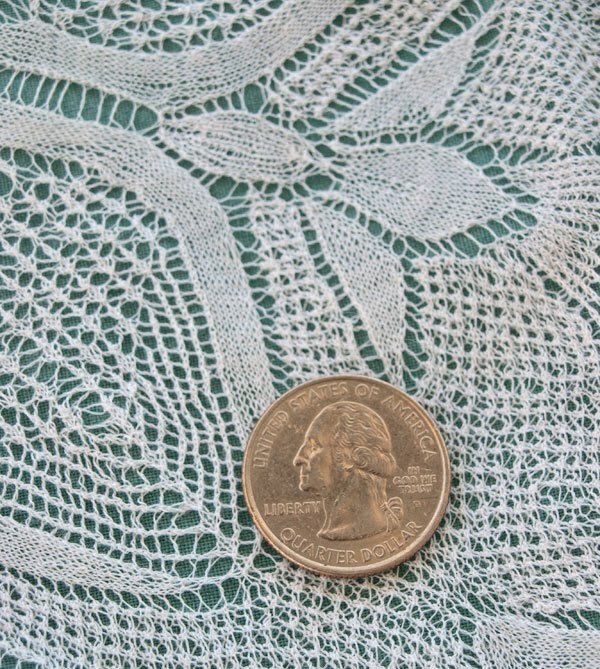 Check out these for handsewing and knitting.